Pravin Gordhan was born in Durban in 1949. He graduated from the University of Durban-Westville with a Bachelor of Pharmacy degree in 1973. He worked at King Edward VIII Hospital, Durban between 1974 and the end of 1981 when the Natal Provincial Administration dismissed him for his political activities while he was in detention. Gordhan became politically active at University and joined the Natal Indian Congress (NIC). He was elected to its executive committee in 1974. 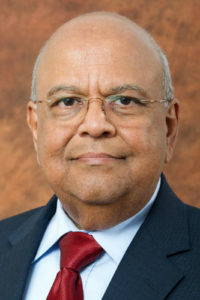 Gordhan was involved in the formation of the United Democratic Front (UDF) in 1983. During the 1970s, Gordhan helped establish grassroots civic organisations that campaigned for better living conditions. He became involved in the underground of the African National Congress (ANC) and later the South African Communist Party (SACP). He was detained three times by the apartheid government and spent four years in the underground within the country during the state of emergency between 1986 and 1990. During this time, he was involved in Operation Vula, a project of the ANC initiated by President Oliver Tambo. He was a representative of the Natal and Transvaal Indian Congresses at the CODESA negotiations which resulted in the first democratic elections in South Africa on April 1994.He became a Member of Parliament for the ANC in 1994 until 1998 and participated in the drafting of South Africa’s Constitution. From 1998/9 until May 2009 he was deputy Commissioner and Commissioner of the South Africa Revenue Service, leading a team that transformed the Revenue Service into a modern and highly effective institution. He was elected chairperson of the Council of the World Customs Organisation and the Forum of Tax Administration during this time.